David Ginsberg has been photographing images for over thirty years. He holds a degree in photography from Art Center College of Design in Pasadena, and has pursued his passion of photography, in both the commercial advertising industry and as an art form. He has had studios in Los Angeles, California, Mexico City, Mexico, and Minneapolis, Minnesota. David has won numerous meritorious awards for his work, and his commercial client list over the years has included many national clients. Whether he is shooting fashion, products, or his fine art pieces, David's strong sense of design and attention to detail are evident in the work. Early in his career, David's ability to discern and put together imagery that took assignments to the next level was recognized by the art directors and agencies that hired him. Before long he was asked to shoot images for the music industry, for use as cover art. What followed were more jobs being offered, these coming from the fashion industry. The client list grew to include ads for fashion that wanted to see their product used as part of an image that was more art than hard sell. The work spread to international levels, a second studio was opened in Mexico City. The work continued to flow in, David started to explore more artistic forms, turning his attention, when time allowed, to images that were less dependent on artificial lighting, moving things to exterior shots, using natural light and backgrounds, looking for the combination of design and light that would create each image as an individual, stand alone work of art, that could capture the viewers attention and transport them to a new, unexplored place. Two years after opening the studio in Mexico, the winds of politics changed there, forcing the closure of the studio. The economy in California fell prey to an economic recession, and advertising budgets began to dry up. Looking for more fertile ground to continue the growth of his studio David moved to Minneapolis, establishing a new studio and new clients. 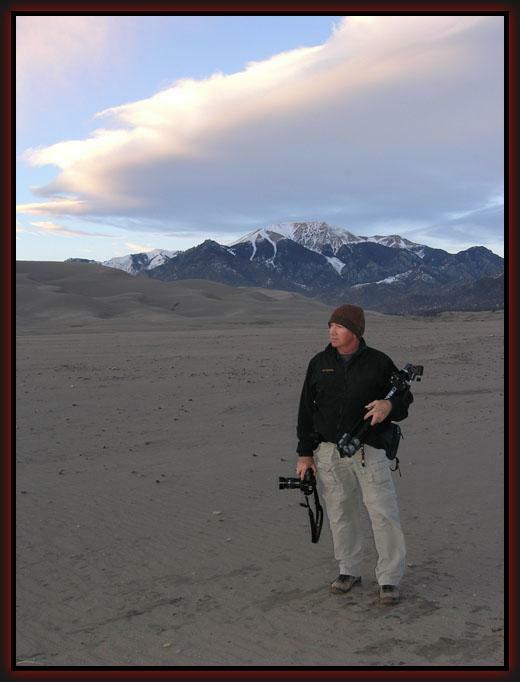 David continues to shoot commercially, and has expended his photographic eye to the art of landscape photography.. Whenever he is sent on assignment, he takes a day or two extra to explore the place he has been sent to, and photograph the area, capturing it's own unique beauty. His first publication " American Light" is available only on this website in a limited edition series. The images shown here are also available, and are in limited editions as well. As a photographer, David has always felt that, because photographic images are so easily reproduced, in order for them to retain their intrinsic value, they should be reproduced in limited numbers. "Photographing landscapes, that are more than just pretty pictures, requires the photographer to have an understanding of what constitutes a well balanced design between what is there and how the light affects that perception. All of the compositional elements should be taken into consideration, so that the eye, when viewing the image, is kept circulating within the picture, picking up small details that spur the eye onward to complete the visual exploration of the image. If the image can stand alone without the use of matting or framing, the image is well crafted and successful."